All the hospitals I have worked in recently have well set-up and well ran acute stroke services which involve lysis. Despite my scepticism on the evidence base for lytics in stroke, medicine and emergency medicine in particular is a team sport so just because I find myself in the position of scepticism does not allow me to deny patients access to other professionals and treatments that I may differ from. Just remember you work for a hospital – don’t get fired over it. If your hospital does tPA for stroke and you’re involved then you’d be best to do it as well as you possibly can. I’ve endeavoured to keep this somewhat up to date but the sheer volume of published literature makes it difficult. I’ve also collated a table of some of the numbers from the studies regarding outcomes and adverse events. I’ve tried to use the NINDS definition for SICH if I can find it in the corresponding paper. Let me know if I’ve got any of the numbers wrong. I’ve added my thoughts on IST-3 at the very bottom and updated the table below. I’ve presented on this a couple of times but this is gonna require a few parts, so be patient with me. This is not quite a deep-dive in the SMART EM sense, more of a shallow dive you might do with a snorkel rather than a full on SCUBA. UPDATE 2012: The Australian College of Emergency Medicine have a nice little statement on tPA in stroke that can be found here. I don’t mean in this series of posts to discard the idea that thrombolysis is useful in ischaemic stroke, I just mean to explore the evidence for its use and show that its evidence base makes it a controversial treatment, I would argue it makes it an experimental treatment. Thrombolysis came into every day use with its role in STEMI; initially with streptokinase and then succeeded by tPA. In addition, in STEMI we have a clearly defined disease process, with a quick and easy to interpret diagnostic test with some important, but usually easily defined mimics. In contrast, the origin of the use and license for tPA in stroke is based on a single RCT in the mid-90s which was based on 300 people. (I know there were 600 in the trial but I’ll expand on that later). The more recent discussion (and indeed the AHA level I recommendation) for 3-4.5 hrs is based on the ECASS III trial and I’ll cover that too. Let me say again, my aim is not to prove to you that tPA for stroke is of no use in stroke, my aim is to make it clear that we are not yet at the stage of being able to say definitive things about its role. There have so far been 11 published RCTs (that I know of) of the use of thrombolytic therapy for acute ischaemic stroke. 2 of these can be regarded as positive, 9 as negative (the EPITHET trial is a bit unusual in its outcomes and I consider it negative but we’ll cover that). Please take note of that. Three of the earlier ones concerned the use of streptokinase (ASK, MAST-ITALY, MAST-EUROPE). Two were negative, one was stopped early due to harm. I’m not gonna cover them in this series as no one is actually using strep for stroke these days. I’ll put a link to them in the references. First thing to note is that this was actually two trials reported as one. Part 2, the pivotal study, used four outcome measures representing different aspects of recovery from stroke to assess whether treatment with t-PA resulted in sustained clinical benefit at three months. Part one wanted to assess whether if you were given tPA or placebo whether you would have a 4 point improvement in your NIHSS at 24 hrs. This is very different from living independently at 3 months; something we really care about. In both parts the time to treatment was divided into two: 0-90 mins and 91-180 mins. There was a requirement for equal numbers in both the early and late groups. It is extrmely difficult to have a stroke, get to hospital, get seen, get a CT and a decision to get tPA within 90 mins. Most of the people given thrombolysis in real life are in the 91-180 min group. In some of the other trials with a more liberal protocol (up to 6 hrs) the average time is around 4 hrs. In NINDS the radiographic criteria were a base-line computed tomographic (CT) scan of the brain that showed no evidence of intracranial hemorrhage. Those of you who have read about stroke lysis before wil realise that this is not considered an appropriate CT criteria these days. Indeed I’ve heard a few neuroradiologists and neurologists say that you shouldn’t be giving tPA unless you can see some early signs of infarction on the base-line scan. 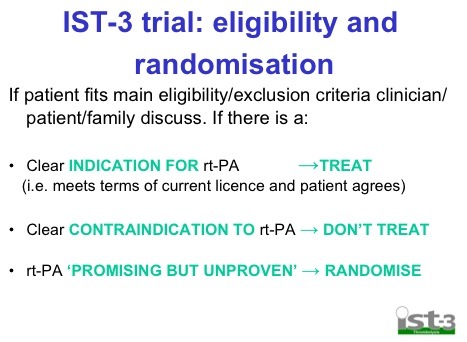 You should have a primary outcome for your trial. In NINDS they had 4. That’s kind of a cheat. The more you have, the more likely you’re gonna have one turn positive. They also included the NIHSS as one of their 3 month outcomes which which raises an important point. The NIHSS is a good marker of stroke severity but it’s not necessarily linear. The difference between a 12 and 16 is not necessarily the same as the difference between a 20 and a 24. So if you see a 4 point difference in the NIHSS at 2 hrs or 3 months, that doesn’t mean you have a comparable clinically significant improvement. This is not what the NIHSS had been used for before – the authors even state this in the paper. Again, if you’ve been following the literature, you’ll see that this definition varies from study to study. One of the problems that makes comparing these results difficult. If you died in this trial, all that got recorded was your death and the presumed cause, if you died suddenly from an ICH and you didn’t get a post-mortem (this wasn’t a requirement) then this wasn’t noted. The first thing is to look at the patients we’re interested in. For brevity I’m only gonna look at part 2; the group that had 3 month outcomes assessed (the only thing we really care about). 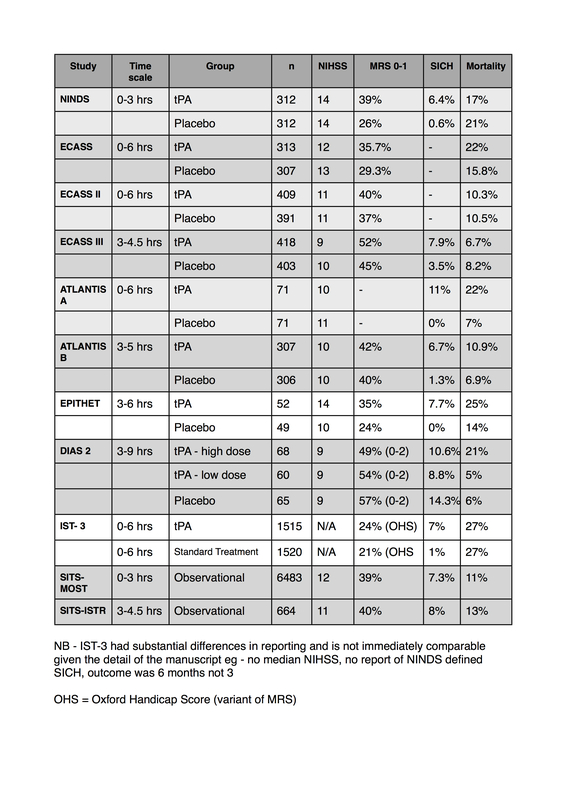 The tables show that patients in the placebo group had more severe strokes. This doesn’t mean anyone fiddled the trial so that the sicker patients ended up in the placebo group; this variation is easily possible when you have two groups of only 150 each. On the basis of Part 2 of this trial (one group of 150 who got placebo, one group of 150 who got tPA) tPA got FDA approval. Despite calls for further research, once it got FDA approval, people came out and said it would be unethical to repeat a placebo controlled trial at 0-3 hrs as tPA was “proven” to be helpful. So much for the NINDS trial. Next I’ll try and cover some of the other trials arranged by the groups who investigated them. You may have seen these two trials. The most important thing to be said about these is that they are not trials. They are reports of voluntary registry data (caveat – the european license dictated the setting up of these registries but that doesn’t mean it’s enforced) of patients who recieved thrombolysis. This is purely observational data of patients who someone thought should get tPA. Despite this the authors do multiple comparisons with historical controls – chosen favorably from amongst the prior trials. This is comparing apples and oranges. I hope it’s clear that the patients getting tPA in the SITS papers are different patients than those in the other papers. Therefore it is not fair to claim comparable efficacy. This is a major objection to the thrombolytic literature in general, and in particular it’s combination in meta-analyses. The NNT summary covers this idea well. The ATLANTIS trial was presented in two parts. Initially it was intended to be one trial, looking at tPA form 0-6 hours. Once the NINDS study was published, the investigators scapped the idea of giving placebo to the o-3 hr patients as this was considered unethical. the safety monitoring committee found concerning results in the 5-6 hr patients given tPA. Thus Atlantis A was a trial of 0-6 hrs that was stopped and Atlantis B was a re-launch taking patients at 3-5hours. I would contend that both of these outcomes scream SURROGATE MARKER. most were thrombolysed after 4 hrs. This is understandable – it was the early 90s after all; there weren’t many stroke teams about. Of the patients with an NIHSS>20 who got tPA every one of them (16 of them) was dead by 90 days. They took patients from 3-5 hours and changed the inclusion criteria subtly. Patients with a CT showing greater than 1/3 of the MCA territory involved were excluded. The basic effect is to exclude the bigger strokes. This is now ubiquitous in the newer trials. they had the ambitious primary outcome of an NIHSS of 0-1 (on a 42 point scale!) at 90 days. 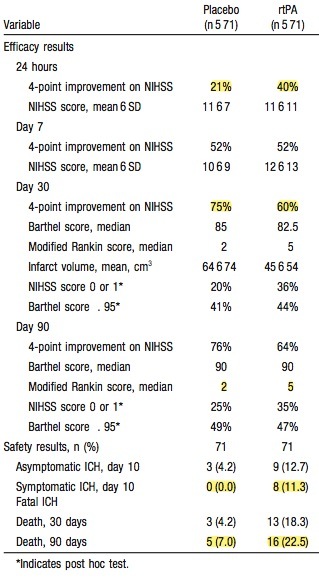 In the secondary outcomes they had the modified rankin scale that we’re probably more interested in. they recruited 600 patients, most of whom who got lysis at about 4 hrs or so. 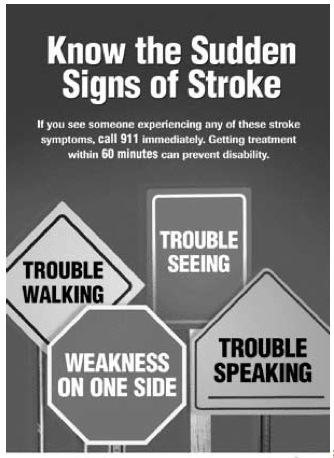 Again they were less severe strokes – NIHSS of 10 in this trial. 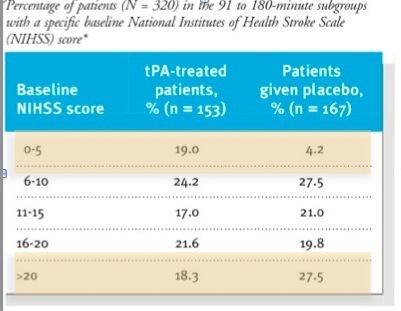 32% of placebo patients and 34% of tPA patients had an NIHSS of 1 or less at 90 days. These trials are important when it comes to reading ECASS III as it claimes postive effects on patients treated beyond the 3 hr mark, whereas these trials showed that people did really poorly beyond the 3 hr mark. Pretty similar in aims as the ATLANTIS study we talked about last time. they excluded over 100 on the basis of CT signs- remember this the next time your general radiologist has given you a report simply saying no bleed. note that these 100 they excluded were excluded after inclusion in the trial after review of CT scan by a study radiologist. That’s a bit naughty as you might suspect. mortality was 22% tPA v 15% placebo. If the treatment increases mortality then you can see why I consider this a -ve trial. randomised in blocks so as to have some in the 0-3 hr group and some in the 3-6 hour group. again they excluded 10% in each group retrospectively based on CT findings. So despite a strict definition and extensive training of all the radiologists for the study, they still called it wrong 10% of the time. This trial is negative by their primary outcome but mortality at least remained equal. In addition they more than doubled the rate of SICH. In our study, we modified the ECASS definition of symptomatic intracranial hemorrhage by specifying that the hemorrhage had to have been identified as the predominant cause of the neurologic deterioration. Remember that the investigators get to decide this, and this allows them to define SICH pretty much as they want. 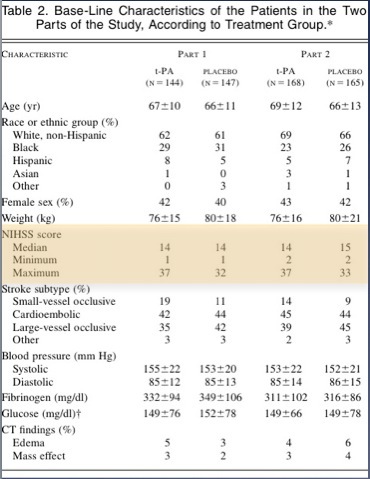 Median NIHSS of 9 in tPA group and 10 in the placebo group. (p-value of 0.03 for this). People had more severe strokes in the placebo group. they try to adjust for the significant baseline variations in the groups with logistical regression – they tell us that there was still a significant difference after adjustment but you have to be a believer in logistical regression; that it can accurately adjust for not just the stated confounding variables but all the ones that you don’t know about. By their trial design and definitions this is a positive trial, you just have to decide if the problems outlined above are enough to call it into question. Note that this trial enabled recommendations that tPA is safe for 3-4.5 hrs. This despite that all prior trials treating patients at the same time periods were killing patients and were terminated early. I’m reviewing these two trials as they both looked at what could be a really interesting and useful idea – using imaging to select patients who would most likely benefit from tPA. This isn’t particularly important to understand fully but in an ischaemic stroke there is such a thing as an ischaemic penumbra – an area of brain tissue surrounding the central infarct; that if perfusion is quickly reestablished may recover well. The idea is to use imaging (mainly CT perfusion or diffusion weighted MR) to identify such patients and target treatment at them and not the others. There is lots or pre-RCT research on this if you’re interested, trying to define what all the above actually looks like in practice, but below are the RCTs involved. There’s really two things going on here. An RCT for tPA v placebo and an observational imaging study to define the useful penumbra. secondary outcomes included lots of imaging based composite outcomes including some clinical features. this means that the trial will be drastically underpowered to detect anything we care about. in all the trials adjudication of SICH is done by a central blinded committee. in some of the trials these are directly paid employees of the company making the drug. in a tPA trial if you’re asked to adjudicate on a case where the patient had deterioration and bleed following the study drug you know full well that they got tPA and not placebo. This means that you aren’t really blinded and there’s potential for bias in classifying patients as SICH. This is a problem for pretty much all the trials. 100 patients total (50 tPA, 50 placebo) – and yes you’re right that’s a tiny trial. Whenever’s there’s less than 100 in a group talking about stats in percentages bcomes kind of meaningless. note the implications of that – they couldn’t do the 90 day scan because twice as many had died in the tPA group. Nevermind the “6 lost to follow-up” who may well be dead, especially as there was only one lost to follow-up in the placebo group. They tell us that the mortality difference was non-statiscally significant and in a trial this small it’s always going to be hard to tell, especially when over 10% of the patients in the tPA group are “lost to follow up”. It really matters what happens to those patients in such a small trial. If those 6 patients are dead then there would be a “statistical difference” in mortality. Whether or not there’s a statistically significant difference (and I doubt it matters here) then you need to decide whether that worries you or not. the rest of the paper is about the penumbra stuff and looking at who reperfused and who didn’t. And people who got tPA reperfused more often. Let me say again – this is a surrogate that I don’t really care so much about. having read the details of the trial and looked at the tiny numbers involved I’m not sure I agree. they also make this statement in the results section of the abstract, the bit that most people will read! Reperfusion was more common with alteplase than with placebo and was associated with less infarct growth (p=0·001), better neurological outcome (p<0·0001), and better functional outcome (p=0·010) than was no reperfusion. if you asked the trial to answer this question: is tPA associated with better functional outcome then the answer is NO. 30% had no penumbra by imaging and were excluded. This varies from study to study but it’s a useful figure to keep in your head. mRS<3: placebo – 59%; low dose 54%; high dose 49% – PLACEBO SAVES THE DAY! The high response rate in the placebo group could be explained by the mild strokes recorded, which possibly reduced the potential to detect any effect of desmoteplase. This begs the question – if these low grade strokes (selected out by the finest imaging and clinical lessons learned from prior trials) do so well that we can’t see the benefit of this wonder drug then why the hell should we be using it? Only a quickie this time. I mentioned in the first part that I wasn’t planning to discuss the details of the MAST trials as they used streptokinase as the agent and this is no longer used. I re-read them and found this crackingquote from the authors of the second MAST trial. Note that at this stage MAST-I, MAST-E, ECASS I, and ASK trials had all been published and had increased mortality. Only NINDS had been published as +ve. This was 1996. The possibility cannot be ruled out that the results of the NINDS trial are due to chance; the results of a single trial do not provide sufficient evidence of the efficacy and safety of a drug, especially when similar trials have conflicting results. My suspicion that tPA isn’t all it’s cracked up to be is fleshed out in the previous 4 and a half parts. Where I work mostly, the stroke team deal with any potential lytic cases. For once I’m very glad that EM in Ireland is dysfunctional enough that we’re not taking the lead on this. For example – i’m not entirely sure how to approach informed consent on this. How do you explain the complexities of this to a patient? My suspicion is that thrombolysis is beneficical for certain people with certain strokes, I’m not convinced we know who those patients are yet. I find the overwhelming support for such a controversial and potentially dangerous (approved on the basis of a 300 patient trial despite multiple negative trials) treatment to be premature. I think the way forward from here is to replicate the findings of the NINDS trial with a substantial population (as was done repeatedly with lytics for STEMI) in a non-pharma sponsored trial. I used to say that there wasn’t the slightest appetite for this to be done. But it’s nice to be wrong. It’ll have finished enrolling by the time this blog post is published. This is gonna be a 3000 patient trial. To put that in context, the cochrane systematic review of lytics in stroke has 2955 patients in it. If any trial is gonna give us the answer then this one will. So I look forward to having my mind changed! No doubt you’ll hear more from me when it gets published. oddly an increase in fatal swelling (odd because if tPA works then the infarct would be smaller and the swelling would be less) of infarcts in tPA group of 47 pts v 25 pts. This is played down as inconsistent with prior studies in the paper UPDATE: it was pointed out to me by a fine neurologist that when you lyse the clot you get reperfusion oedema so this is actually a sign the tPA does breakdown clot. It makes sense. It’s still a problem if the reperfusion oedema kills people, but it’s not oedema simply from a big infarct. Hey Andy, was just re-reading your awesome summary on lysis and nipped over to the IST3 website and noticed one small detail which interested (concerned?) me. I had a look at the recruitment and randomisation process, and although at face value it seems useful that current off-label “indications” would be included, I wondered somewhat how they would analyse the data from those they state as having a “clear indication” for tPA. The value of the trial could hinge on how they incorporate the data from this group… Just a thought, care to comment? Will DM you a screen grab on the bit I mean on Twitter if I can.